The Argentine minister of the Treasury gave a welcome speech on Tuesday 18 September. He underlined the work carried out by the Think 20 to transform ideas and contribute to the creation and implementation of public policies. 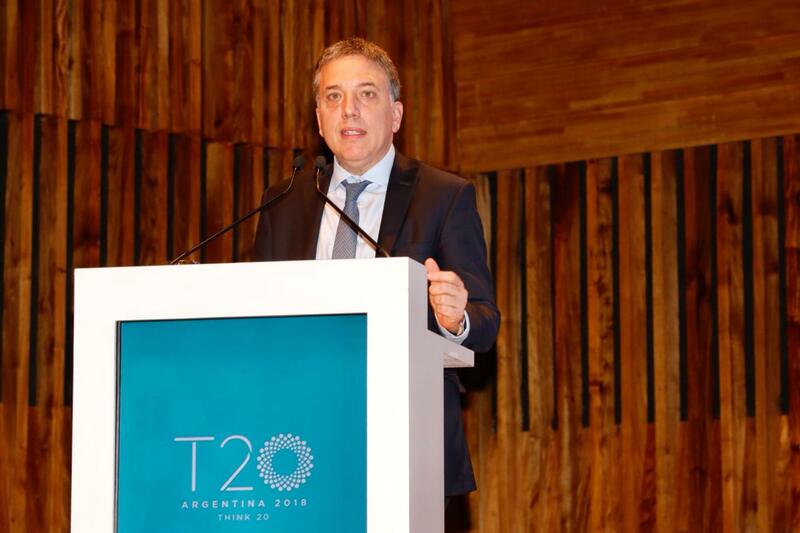 The Argentine minister of the Treasury, Nicolás Dujovne, gave welcome remarks on the second day of the T20 Summit on Tuesday 18 September. Dujovne underlined the Think 20’s work carried out throughout the year and thanked the leadership of CARI and CIPPEC. “It seems we are very far from the T20’s launch which we did together in the Palacio San Martín. I am very content and proud of what it has achieved, bringing together more than 150 think tank from over 60 countries,” said the minister. On Monday morning, the presidents of CARI and CIPPEC, Adalberto Rodríguez Giavarini and Jorge Mandelbaum, gave president Mauricio Macri the Communiqué, a document containing the engagement group’s vision on global governance and policy recommendations. Apart from president Mauricio Macri and minister Dujovne, other national officials will attend the T20 Summit. This includes Laura Jaitman, the G20 Finance Track representative, who will participate in a conversation on the G20 and the New World Order, and the secretary of culture Pablo Avelluto who introduced to the conference Nicholas Burbules, a specialist in philosophy of education. The minister of foreign affairs Jorge Faurie gave a welcome speech at the T20 Summit’s cocktail that took place on Sunday at Buenos Aires City Hall. You can follow the main T20 Summit sessions live here.